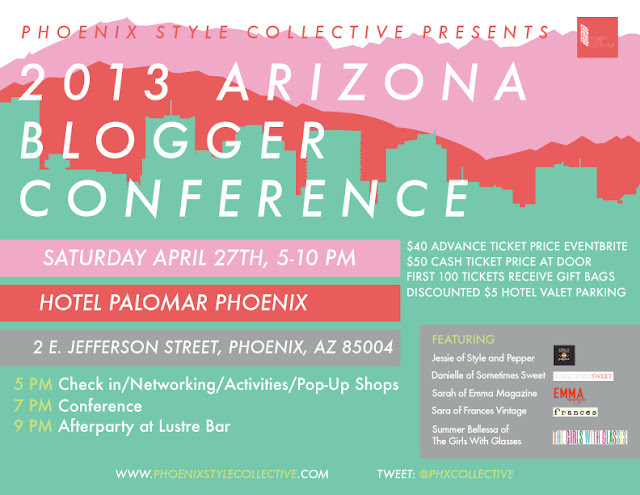 I am excited to announce that the Arizona Blogger Conference is coming back for year number two! We, the Phoenix Style Collective, were thrilled we had such an amazing turnout last year and have somehow managed to make this year's conference even bigger and better. I can't even wait for everyone to get there! Pop up shops! Goody bags! Instagramoverloadtimesonethousand! The conference will be held at the Hotel Palomar in downtown Phoenix. It's very swanky and cool. This year's speakers include the fashionable Jessie of Style and Pepper (flying in from New York! ), the lovely Danielle of Sometimes Sweet, Sarah and Sara of Emma Magazine and Frances Vintage (respectively), and the too cute Summer of The Girls with Glasses! Can I get a three cheers for this lineup? I have looked up to many of these ladies throughout my blogging career. To know that we will have the opportunity to pick their brains for a while, to learn a few secrets behind their much deserved success, is a little much for the brain to handle. Girl crush overload. Followed by an all out dancefest at the Palomar's Lustre bar. Can I get another three cheers? Hey, you guys did an ahhhhmazing job organizing the event. I know you said three cheers to the dancefest, but three cheers to you all. Twas glorious.